Cisco unveiled the “Cisco Cius” today unveiled a tablet device targeted towards the business user. This unique tablet device brings new meaning to the word convergence combining all of Ciscos’ communication and collaboration applications in a hand held tablet capable of running HD Video and more. This hand held tablet weighs in at just 1.15 lbs and docks in what looks like a business phone. The Cius supports email, video chat, video conferencing and more. Cisco has taken a big leap of faith in the Android platform as typically, except for household routers, Cisco is a name that is known for their place in the office. 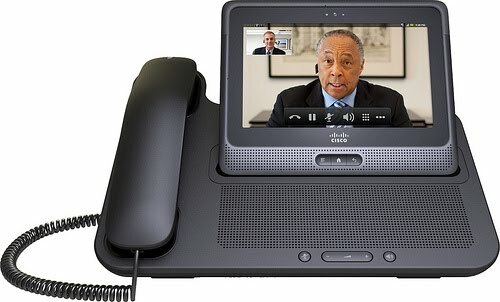 So those who think that Android is for teens and games and Blackberry is for the office, think again with a company like Cisco choosing Android to backbone this unique new device, it truly keeps the momentum of Android moving forward. LAS VEGAS – June 29, 2010 – Cisco today unveiled Cisco Cius, a first-of-its-kind mobile collaboration business tablet that delivers virtual desktop integration with anywhere, anytime access to the full range of Cisco collaboration and communication applications, including HD video. Cisco Cius provides support for the comprehensive suite of Cisco collaboration applications including Cisco Quad,Cisco Show and Share, Cisco WebEx Connect, Cisco WebEx Meeting Center, Cisco Presence, and interoperability withCisco TelePresence. Cisco Cius is supported by Cisco Unified Communications Manager and is easily integrated into existing Cisco customer environments. Cisco Cius helps ensure a more secure mobile collaboration experience by leveraging Cisco AnyConnect VPN Security, part of the Cisco Borderless Networks architecture. Virtual desktop integration provides IT organizations with the ability to host software applications securely in the data center and to utilize the Cisco network to deliver those applications ‘as-a-service’ anytime, anywhere. Cisco Cius thereby supports data center consolidation and reduced software licensing costs. Cisco Cius offers businesses the ability to take advantage of the ever-expanding ecosystem of cost-effective, third-party applications, supported by the Android operating system, while controlling user access policy. Cisco will help expand Android developed applications for business by offering Cisco Collaboration Application Protocol Interfaces (API’s) to developers through a Software Developer’s Kit (SDK). Customer trials of Cisco Cius will begin in the third quarter of calendar year 2010, with general availability in the first quarter of calendar year 2011.